I know this is a bit late but, as usual, we've been very busy. 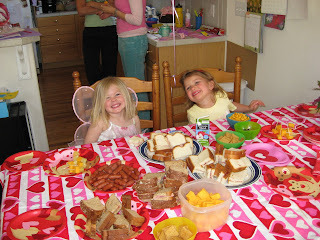 Abi had a brilliant 4th birthday. On her actual birthday we went to the zoo and met up with one of her friends and his Dad and that evening the neighbours came around. Everyone had a great time on the trampoline and playing the chocolate game. 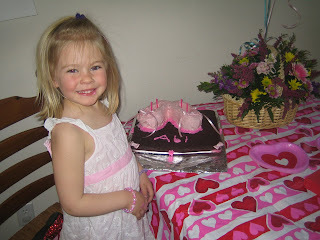 Abi had her 2nd cake - ballet shoes (1st cake was with the Scottish relatives). Saturday it was her school friends around for a party. 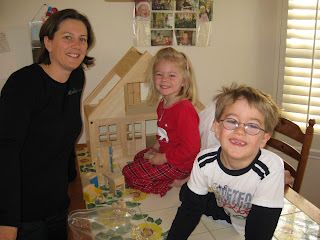 Allen managed to disappear with Jacob to go to soccer and Abi and I prepared for 15 3 and 4 year olds. We had employed our 3 teenage neighbours to come and help for the 2 hours and it was a very good idea. One looked after the craft table, one monitored the trampoline and the other was in charge of the water pistols. So we could actually chat to everyone. We did parcel the parcel and the witches cardigan game - a game I remember my sister doing for me at one of my birthday parties. Both went down brilliantly and everyone left late and happy! Abi had a wonderful time and has had to make 30 thank you cards. 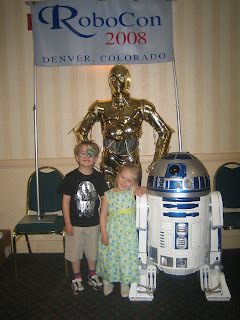 We went to a sci fi convention on the Sunday - very strange but Jacob and Abi loved all the Star Wars things. Anne, Pete and Emily arrived on Friday so we've been out and about with them. It has been a shock having a one year old around again, you soon forget what it's like! Abi's been very good with her and Emily loves being with my 2. Jacob's not very forgiving though and has had a few trips to the naughty step to remember not to throw and push. He's had another treatment for his skin and I'm hoping only one more will be needed. His important eye appointment is coming up so we'll see what happens then. Been very busy helping at school and continuing with Arbonne. Allen's been in Australia for a week and we have coped very well. It'll be good to see him on Saturday although we're off out for a meal that night - not sure what time zone he'll be on. Next trip is camping in Zion with Carrie and co - can't wait, we really miss seeing them. Not sure how the camping will go but I am looking forward to seeing how the children are together and sharing a few beers with Carrie and Brian - and seeing the wonderful scenery of course! Happy Birthday Abi! Sounds like you had a great birthday. We are excited for this weekend. I'll touch base later on this week to make sure all is in order. We can't wait. My camera has broken (got sand in it on one of Brian's hikes) ugh! I think I'll be purchasing a new one this week.